Measure at 1.55 μm (1550 nm) wavelength. 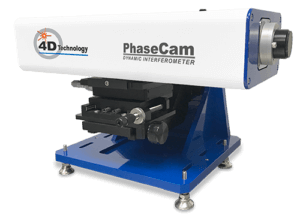 The PhaseCam® SWIR interferometer is a is a highly compact, lightweight dynamic laser interferometer with fully motorized controls for measurement of optics and optical systems. Operating at a wavelength of 1550 nm the PhaseCam 6100 SWIR is ideal for long optical path-length measurement of large afocal optical systems such as concave telescope mirrors and lens systems, and for testing small aperture afocal components such as flat mirrors and collimators. The PhaseCam laser interferometer incorporates Dynamic Interferometry® technology, using a single camera, high-speed optical phase sensor to make wavefront measurements thousands of times faster than a temporal phase shifting interferometer. Because acquisition time is so short, the PhaseCam can measure under almost any conditions, without vibration isolation, making the PhaseCam ideally suited for the production floor, in clean rooms and in environmental test chambers. Compact and lightweight, the PhaseCam 6100 was designed with performance and remote measurement in mind. Moving the system to reconfigure a test set is simple and easy, and isolation equipment is not required. Fully motorized controls make it easy to operate the system in remote locations. PhaseCam 6100 SWIR systems include 4Sight™ advanced wavefront analysis software, providing extensive 2D and 3D analysis and visualization tools, as well as comprehensive filtering, masking, database and import/export functions.